Manaaki Whenua's Web Map Services. This site provides information and explanations on how to access Manaaki Whenua's Web Map Services. These services provide access to science and base maps of New Zealand, for use by developers and users of desktop mapping applications. Currently our Web Map Services are provided in several forms, which fall into two groups: uncached maps that are rendered on the fly, and a more restrictive but generally quicker to render, set of cached map tiles. Use our cached services if performance, specifically the time it takes to draw the map, is a key requirement. The uncached services are more suited if quality and sharpness of image at all scales is important, for example for producing static maps for reports in a desktop mapping application. These services have been established and are operated by the Informatics team at Manaaki Whenua - Landcare Research New Zealand Limited. We intend to make additional Web Map Services available in the future. 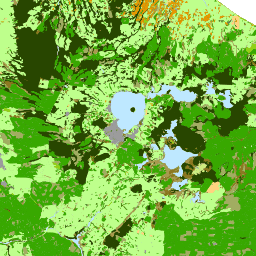 The services provide access to a topographic base map of New Zealand (shown in a dynamic OpenLayers map to the right), a landcover relief base map of New Zealand which uses ECOSAT Landcover data, layers from the New Zealand Land Resource Inventory (NZLRI), layers from the Land Cover Database (LCDB) (all versions) and a layer from the Fundamental Soil Layer (FSL) New Zealand Soil Classification (NZSC). The NZLRI is a national database of physical land resource information. You can find out more about the NZLRI on the LRIS Portal. The LCDB is a thematic classification of land cover and land use classes. The current version LCDB v4.1 contains 33 classes designed to be compatible with earlier LCDB versions. You can download the data about the LCDB dataset on the LRIS Portal, and can find out more at the LCDB website. Developed in the 1980s, the NZSC has a hierarchical structure with five levels: Order, Group, Subgroup, Family, Sibling. Further information can be found at Landcare Research's Soil Portal. The uncached services can be accessed through the OpenGIS® Web Map Service Interface Standard (WMS) (Versions 1.1.1 & 1.3.0). The OpenGIS® Web Map Service Interface Standard (WMS) provides a simple HTTP interface for requesting geo-registered map images from one or more distributed spatial databases. A WMS request defines the geographic layer(s) and area of interest to be processed. The response to the request is one or more geo-registered map images (returned as JPEG, PNG, etc) that can be displayed in a browser application. We have implemented WMS using MapServer. For details of using WMS version 1.3.0, check out a description and example requests here and the OpenLayers section on the Using Services page. The pre-cached map tiles can be accessed using one of the supported tile service protocols. Perhaps the easiest way is using the commonly used standard OpenGIS Web Map Service Version 1.1.1 requests. OpenGIS Web Map Tile Service (WMTS) is also supported. WMTS is an official OGC standard for delivering tiled geographic data. This service follows the standard OGC WMTS requests and supports both the OGC style key-value pairs encoded and REST style requests. In addition, our layers are accessible using the GoogleMaps XYZ Service, or the Tile Map Service (TMS). TMS is a specification for storing and retrieving geographic data, developed by the Open Source Geospatial Foundation, however it is not an official standard. We have implemented our cached services using Mapserver's Mapcache. Web Feature Services (WFS) are available for some of Landcare Research’s data through the 'Services' tab of the respective layers in the LRIS Portal. button to copy the request to your clipboard. To find out how to use our services in Openlayers or desktop GIS like Quantum GIS and uDig click here. GetLegendGraphic requests are supported by the WMS. To view these legends and their corresponding requests click here, alternatively click on a record in one of the tables. Manaaki Whenua - Landcare Research New Zealand Limited has compiled the maps we make available through these services from information derived from a variety of sources. The information may not be complete, correct or up to date. We do not accept responsibility for any actions taken in reliance on it or consequences arising from the use of it. The web services use data for the basemap layers sourced from the Land Information New Zealand's NZTopo Database and Manaaki Whenua's own in-house datasets. Do not use the maps for navigation purposes or in any application which potentially lives might depend upon. The science information provided by this service is licensed under Creative Commons CC-BY New Zealand license. Source: Manaaki Whenua and licensed by Manaaki Whenua for re-use under Creative Commons CC-BY New Zealand license. Except as required by law or as otherwise agreed in writing between us, the maps are licensed by Manaaki Whenua on an "as is" and "as available" basis and without any warranty of any kind, either express or implied. Subject to any liability which may not be excluded or limited by law Manaaki Whenua shall not be liable on any legal basis (including without limitation negligence) and expressly excludes all liability for loss or damage howsoever and whenever caused to you. © Landcare Research NZ Limited 2009-. Contains data sourced from LINZ. Crown Copyright Reserved. Copyright should be applied using the most appropriate method for the client being used to display our services, e.g. "ol.Attribution" in OpenLayers or "Copyright Label Decoration" in QGIS. Further information is available here. By using this site and the web services provided you agree, and are deemed, to be bound by the following Terms. If you choose not to be bound by the following Terms, then Manaaki Whenua does not grant you the right to use this site and its services. damage or destroy the reputation of Manaaki Whenua. You acknowledge that Manaaki Whenua may terminate, suspend or restrict your access to the web services at any time at its absolute discretion. You also acknowledge that Manaaki Whenua may suspend the operation of the services for repair or maintenance work or in order to update the contents or functionality of the website and the web services. You accept that access to or use of the site and web services will not necessarily be uninterrupted or error free. Manaaki Whenua reserves the right to modify or terminate the web services for any reason without notice at any time. Where possible we will make an announcement on this web page of any proposed changes to the web services, interruptions to the services or termination of the services. The sections below describe the key aspects of our services, including supported protocols and standards. Each section contains a link to the relevant capabilities document, the URL used for a getCapabilities request, and example GetMap & GetLegendGraphic requests. Tables are provided which are dynamically populated by a getCapabilities request and summarises what layers are currently available. These services are being run from the Amazon Cloud using a MapServer and Mapserver's Mapcache on top of a PostgreSQL / PostGIS database. Projections currently supported are NZTM (EPSG:2193), NZGD49 (EPSG:27200), WGS84 (EPSG:4326) and Google's Spherical Mercator (EPSG:3857 / EPSG:900913). Our services support both version 1.1.1 & 1.3.0 of the OpenGIS® Web Map Service Interface Standard (WMS). The OpenGIS® WMS Interface Standard is the most widely used standard for generating maps on the web and provides a simple HTTP interface for requesting geo-registered map images from one or more distributed spatial databases. In 1.1.1 geographic coordinate systems specified with the EPSG namespace are defined to have an axis ordering of longitude/latitude. In 1.3.0 (for certain Coordinate Reference Systems, e.g. EPSG:4326) the ordering is latitude/longitude. The 'srs' parameter in the GetMap operation is called 'crs' in 1.3.0. Note the changes of VERSION to '1.3.0', 'SRS' paramater to 'CRS' and BBOX coordinate order reversed. This WMS is for Manaaki Whenua's Topographic Basemaps, operated as part of the SCENZ-Grid project. The data contained includes the terrain, hydrography, transport infrastructure, settlements, coastline and coastal features of New Zealand. This is a WMS for Manaaki Whenua's Land Resource Inventory, operated as part of the SCENZ-Grid project. The data is sourced from Manaaki Whenua's New Zealand Resource Inventory (NZLRI), a single spatial (polygon) layer with national coverage. It comprises several physical resource themes: Land Use capability, Lithology, Soil, etc. The raw data can be downloaded from the LRIS Portal. In addition, Web Feature Services (WFS) are available through the 'Services' tab of the NZLRI layers in the LRIS Portal. Legends/keys for our science layers should display in the preview map window next to the map, alternatively, they can all be viewed here. Dynamic legends can be accessed via the GetLegendGraphic request, see below for an example. This is a WMS for the New Zealand Land Cover Database(s), operated and maintained by Manaaki Whenua. The data is sourced from the Land Cover Database (LCDB), a thematic classification of land cover and land use classes. The current version, LCDB v4.1, contains 33 classes designed to be compatible with earlier LCDB versions. You can download the data at the LRIS Portal, use the WFS via the 'services' tab or obtain more in depth information from the LCDB website. This is a WMS for the Fundamental Soil Layer (FSL) - New Zealand Soil Classification (NZSC), operated and maintained by Manaaki Whenua. The NZSC was developed in the 1980s and consists of four levels: orders, groups, subgroups and soilforms. Currently only the soil groups level is provided. The classification represents the best attempt to classify New Zealand soils, at our current state of knowledge. You can download the data at the LRIS Portal, use the WFS via the 'services' tab or obtain more in depth information from the Soils Portal. Standard OpenGIS Web Map Service Version 1.1.1 requests. This service follows the key-value pairs encoded style. OpenGIS Web Map Tile Service is an official OGC standard for delivering tiled geographic data. This service follows the standard OGC WMTS requests and supports both the OGC style key-value pairs encoded and REST style requests. Tile Map Service (TMS) is a specification for storing and retrieving geographic data, developed by the Open Source Geospatial Foundation, however it is not an official standard. It uses a z/x/y tile naming scheme, where z is zoom level, x is column number, y is row number. Google Maps XYZ Service. Further information and an example page can be found in the Google Maps section. Unlike our WMS, which are accessed via 'maps.scinfo.org.nz/basemaps/wms', 'maps.scinfo.org.nz/lri/wms', 'maps.scinfo.org.nz/fsl/wms' or 'maps.scinfo.org.nz/lcdb/wms', all our cached maps are accessed through 'maps.scinfo.org.nz/cached/'. This means a getCapabilities request to the cached service will return information relating to *all* layers available. Currently NZTM (EPSG:2193), WGS84 (EPSG:4326) & Spherical Mercator (EPSG:3857 / EPSG:900913) are fully supported across all layers. The tables below summarise the layers that are available through our cached service. The tables are dynamically populated via a (filtered) getCapabilities request. Although our cached service has a single endpoint ('https://maps.scinfo.org.nz/cached/'), and therefore all layers use the same base URL (dependent on protocol), these tables have been organised in a similar way to our straight WMS tables. A getCapabilities request to our cached service will return all available layers, examples of which can be found above. Below each table is an example getMap request, which relates to one of the layers in each table. We also provide an OGC CSW (Catalog Services for the Web) which can be used to discovery information on spatial data sets held by Manaaki Whenua. More information on the CSW service can be found here. Web Feature Services (WFS) are available for some of Manaaki Whenua’s data through the 'Services' tab of the respective layers in the LRIS Portal. The web services provided here are one element of scinfo.org.nz, a new repository of authoritative New Zealand science datasets and information. It is has been created in response to a growing expectation that government and publicly funded science data should be readily available in authoritative human and machine readable forms. scinfo.org.nz is hosted by the Informatics Team at Manaaki Whenua. We are a team of 30 data researchers, software developers and system engineers with deep experience in managing specialist science data resources and using them for our research and to support natural resource policy and management. We have particular specialist knowledge of spatial datasets, satellite image analysis, taxonomic data, laboratory data and web services. In attempting to provide useful and usable operational web map services we have encountered a number of issues. When viewing tiles from the cached service in desktop GIS applications, the best results are achieved using one of the recommended scales (see using services for more information). The Capabilities document, provided in response to the GetCapabilities request using the WMS protocol to the cached service, is limited in the amount of metadata provided about the layers.